Crunch$G Come on, we are doing a Yugi week, we had to review Dark Magician. He is the ultimate wizard in terms of attack and defense… yeah, what is there to really say? 2500/2100 is decent, though back in the day was inferior to Blue-Eyes. Cosmo Queen was stronger, but she isn’t a wizard really, so Dark Magician has accurate flavor text. There are a ton of support cards for Dark Magician: The Eye of Timaeus, Dark Magical Circle, Magician Navigation, Eternal Soul, Dark Magic Attack, and the list goes on and on. He might be a vanilla, but the cards that support him makes him a pretty good card. He is a 3 of in any Dark Magician deck. Dark Magician is one of the most iconic cards in the game, and one of my favorites. Dark Magician, from the very start had an uphill battle to fight. A Level 7 vanilla 2500ATK monster was okay, but with Summoned Skull sitting at the same ATK and one less tribute needed, DM wasn’t doing himself any favors. 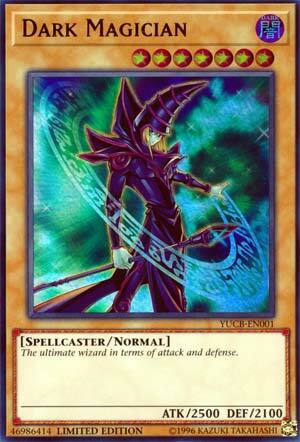 With the support he’s inherited as of late, Dark Magician in its own deck can wreck house. Without support behind it, he isn’t worth running. Level 7 monsters need more than 2500ATK, and those with no effect are even worse. Players would take 2400ATK or lower if they get a good effect out of it, also, one tribute typically less. He needs his own deck, or a deck that involves him like a Dark Paladin Deck. Outside of that, I don’t see why anyone would play him. Alex Searcy Dark Magician also hasn’t been reviewed in a number of years, five, if I’m not mistaken. Dark Magician, while not as powerful as I am, as reference yesterday, has more support than arguably any other card in the game. Playability here also increases with releases such as Spellbooks, as well as countless other cards, makes this card all the better. It’s always been a valid argument too, especially before Spellbooks, or Magaician’s Force, or others, than a two tribute, Normal Monster, with only 2500 attack wasn’t even worth playing at all. Though it seemed to work all right for Yugi, no? Dark Magician is a timeless card, and saying much else, just doesn’t seem necessary.